Don't miss the wave! Customers are always looking for new and exciting experiences, so get ahead of the market by launching an AR campaign this year. At Mortar Studios, we create exciting, immersive, and very engaging Augmented Reality experiences that can help you see a return on your investment. Our team is experienced at creating AR apps for marketing campaigns, brand products, health and fitness, and other business applications. 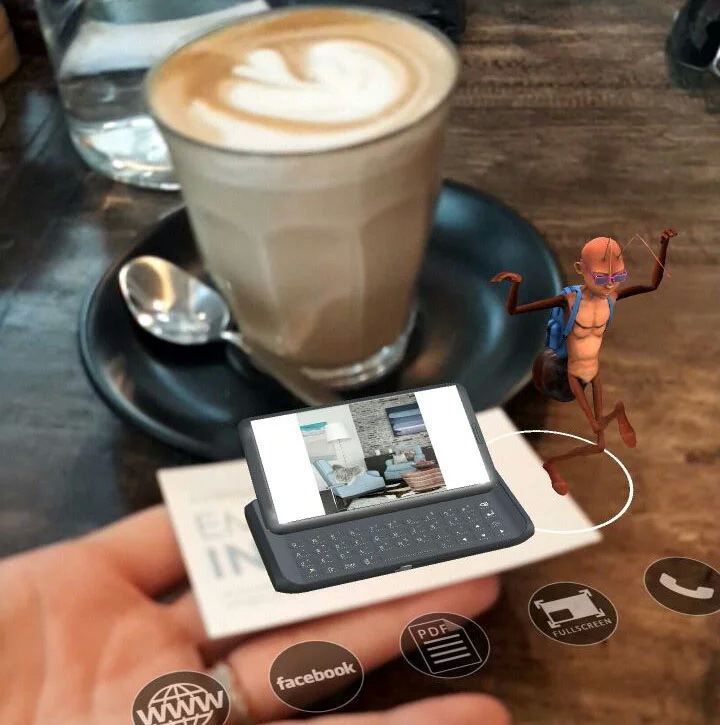 Using Augmented Reality, we can digitally overlay additional information about your brand like corporate videos and 3D animations onto your business cards, company logos, and even coffee & beer coasters. We create client branded AR Apps, so whatever your needs are, we are here to help. We can develop apps for your smart phones, tablets and large screen AR projections. Do you already have ideas on how you would like to incorporate augmented reality into your next campaign but not sure if they’re possible? Get in touch with us to discuss the possibilities. Our AR experts can seamlessly incorporate an exciting AR experience into your next marketing campaign so give us a call today. Augmented Reality is now a special feature in modern devices with the addition of specialized cameras and sensors, and your customers are looking for newer ways to push the boundaries of what's possible. Impress them with markerless AR experiences in your next marketing campaign using ARKit and ARCore technology from Apple and Google. Image a realistic and life-sized 3D model & animation of your CEO appearing in front of your customers and introducing them to your business. How about scanning your office floor and immediately seeing an AR portal (doorway) to a virtual environment of your own making. This will be mind-blowing! For a cutting edge campaign with serious impact, AR is your secret weapon. It is very easy to get started, and can take as little as 4 weeks to have a fully functioning app! This is an excellent way to measure your app’s ROI and also analyse how your customers use your app. Our team can integrate advanced usage analytics into your app to collect a wide range of information such as, the gender, city, country, device operating system, how long your app was used, which pages were viewed, number of installs, what your customers tapped on, etc. This is priceless information that can help you determine what your customers like or don’t like, and then tailor your campaign for maximum return on investment. Simply answer these 3 questions to get your Augmented Reality concept started! 1. What characters, objects, or videos do you want to bring to life in AR? 2. What would you like customers to do in order to see this ? 3. What do you want customers to do after seeing the AR experience? Request our free AR Concept Kit to be emailed to you. Give us a call or contact us via email, and a friendly member of our team will brainstorm a range of ways that you can integrate Augmented Reality into your existing campaigns, and help you spark new ideas for the year ahead. At Mortar Studios, we believe the creation of personalised Augmented Reality experiences should be accessible to everyone, regardless of technical knowledge. We created a set of tools to enable you to make and launch your own AR apps without getting tied down in the technicalities and code. Be the first to know when we launch our AR Startup Kit by entering your email below.